I just updated my java and now I cant open minecontrol at all. I have like java 8 or whatever and they removed the medium setting! it says I can only add it to the exemption list and I don’t have the location to add it.. HELPPP!! 2) go to the Security tab, where you’ll see the ‘Very High’ or ‘High’ security options. Make sure the security level is set to ‘High’. 3) Click the ‘Edit Site List’ button. 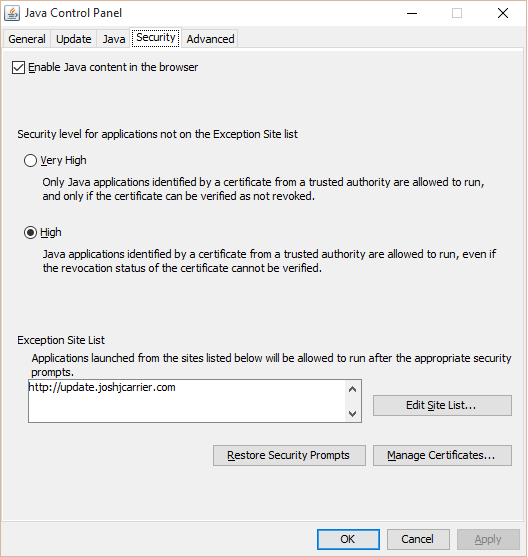 4) On the ‘Exception Site List’ window which should appear, click the ‘Add’ button, then type in ‘ http://update.joshjcarrier.com ‘ (note: there is a ‘J’ in the middle of this address which I missed out the first couple of times). 5) Hit enter on your keyboard, click ‘OK’ to the warning message about HTTP which appears, then click the ‘OK’ button on the window (which will close the window). 6) Click the ‘OK’ button on the Java Control Panel window to close the window. Now, try running MineControl again, agree to running the program despite security concerns, and then MineControl will be alive once more! Heard loads of people mentioning the java block I myself have downloaded it but am skeptical of adding it to exceptions list how can I be sure my pc security will not be breached? I can’t even install the program. Help pleaz. If you have updated the java too version 8 you need to go back too version 7. You can do this by doing a backup restore date on your computer. Just go back a few days and it will work again. i did everything u said but for some reason every time i try run minecontrol i get “application error” any help? Using mac, for some reason everything on the application works fine but the right stick. I cant look around at all, this is a huge problem! Please help! Please update for Java 8 compatibility! I’m tired of waiting! The version of Java on my computer does not allow to set security on anything but High or Very High. What can I do to allow this to download so I can play Minecraft PC with a Xbox 360 controller? How I can reset to default mapping? I’ve installed Java 7, set it to medium. I can run Minecontrol but I have to tick the checkbox each time. It might sound trivial, but I’m trying to get this to launch from within Kodi (where I use an HTPC remote). The checkbox means I need to use the mouse etc.. It’s to try to make this as painless to use as possible for my son. Java 8 security will block minecontrol for minecraft even if the site is on the exception list in both windows 10 internet options and Java control panel. Please help fix this or provide a work around so we may continue to use this product. Thank you. you may have to remove your 32-bit Java and install the 64-bit java as well. When I click on the link for Minecontrol 2.0, Chrome downloads a file called “Download”. I cannot do anything with this file and Windows does not recognize the file type. I’m running Java 64 v8. I’ve added the site to my Java and lowered my security to High, but still cannot get this to work. Im having the same issues. running windows 10. Download the file but cant do anything with the file as it wont link to java. I have the latest java. Im using a sabrant controller. фотосессия для беременных фото креативные фотосессии беременных . беременные фотосессии с мужем фотосессия беременность идеи для семейной фотосессии на природе идеи для новогодней фотосессии с ребенком фото беременной с мужем образы фотосессии . фото с беременными идеи фотосессий беременных фотосессия беременной идеи фотосессия для беременных в Москве отзывы. идеи для фотосессии беременной с мужем фотосессия недорого москва новорожденный фото нежные фото беременных . Not working on MacOS High Sierra!